DAMAK, Jan 20: Dissatisfied with the rate of compensation fixed by the local authorities, most locals have refused the compensation being provided for the land acquired for the Chinese-funded Nepal China Friendly Industrial Park in Damak, Jhapa district. So far, only 13 locals have accepted their share of the compensation; the others are reluctant to do so. Those who have refused the compensation have complained that the compensation rate fixed by the Compensation Determination Committee (CDC) formed under the coordination of the Chief District Officer (CDO) is not scientific. 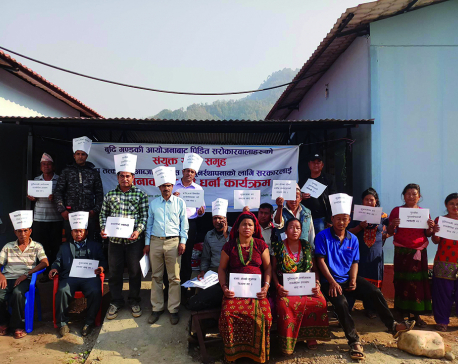 A Coordination and Concern Committee (CCC) formed for the distribution of the compensation has not been able to expedite the compensation distribution process due to the protest by the locals. The much-hyped industrial park is being constructed on 2,200 ~Ibighas~I (approximately 353.23 hectares) of land of Damak, Kamal Rural Municipality and Gauradaha. As many as 60 landowners whose land has been acquired are still out of contact. This time, the Industrial Estate Management Limited (IEML) is preparing to distribute compensation for 411 bigha of land. Sanjay Thapa of the contact office of IEML informed Republica that Rs 25 million has been distributed in compensation so far. Depending on the type of land, the CDC has divided the land being acquired for the park into three categories - arable, non-arable and riverbank land. According to the CDC, the compensation rate for arable land has been fixed at Rs 2.2 million per bigha while those for non-arable and riverbank areas have been fixed at Rs 800,000 and Rs 200,000 per bigha, respectively. Parshuram Karki, coordinator of Damak Industrial Estate Struggle Committee expressed disappointment against the CDC for fixing very low price for the land being acquired. "What is the point in building a park by killing the locals?" asked Karki. According to him, the locals should be provided a fair amount of compensation so that they will not have to live as squatters in the future. The struggle committee has demanded that the rates of compensation be reevaluated for all three types of land. Karan Singh Basnet, secretary of the committee stressed that the compensation must be determined after a field visit. "The value of the land being acquired has been fixed 80% less than the government rate," he claimed, "Though the CDC has determined the price of riverbank area at Rs 200,000 per bigha, a bigha of such land costs Rs 700,000 as per the government rate." IEML has sanctioned a budget of Rs 330 million for the distribution of compensation in the first phase. Meanwhile, Madan Adhikari, chairperson of the CCC accused some locals of refusing the compensation with the ill intention of increasing the compensation amount. "We won't delay the construction of a national pride project due to the vested interest of some people," said Adhikari.